On a sunny morning in October, my husband and I nervously pack a bag in our hotel room. In a few minutes we will head downstairs to meet our agency representative, who will bring us to an orphanage in Pune, India to meet our son for the first time. We are quiet as our 5 year old chatters with excitement because it is finally time to meet her little brother. We have waited ten months for this day, and yet we can hardly believe it’s here. Our journey to our son began on a cold January afternoon in New Hampshire, when I came across a picture of a little baby boy with the most expressive and engaging eyes. His picture was posted on Children’s House Interntational’s waiting children website. A short description of him read “missing fingers and toes.” My first thought was, “That is such an easy need, we can do that!” My husband is missing half of his fingers on one hand, and has been since birth. I quickly showed this little boy’s picture to my husband and asked if it would be ok if I just “inquired” about him. 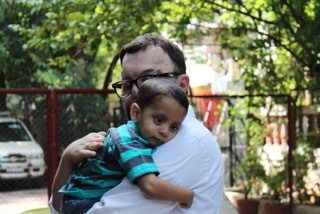 I sent the agency an email asking about the logistics of the international adoption process in India, and I asked if this little boy was still available. When we learned that he was still waiting to be placed with a family, we began to inquire more about him and we talked more candidly about whether or not we could expand our family by one, especially with his unique needs. As it turns out, our son is missing more than just a few fingers and toes. He only has one finger on each hand and one toe on each foot. This was different from our experience and yet we quickly realized that as a family we could figure out how to meet any special need he may have. The logistical and paperwork part of our adoption followed almost exactly the timeline we were given by the country and our agency. 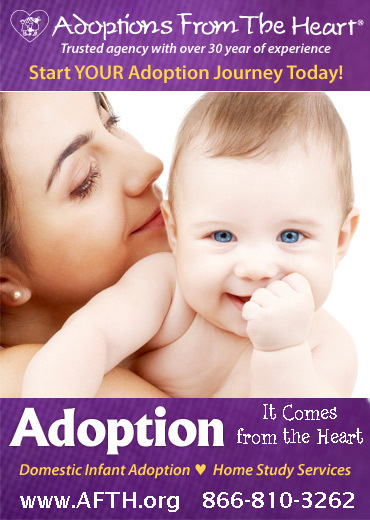 Throughout the entire process, we were very aware of how unusual that is in India and in international adoption in general. We had wonderful communication with our son’s orphanage, through our agency. 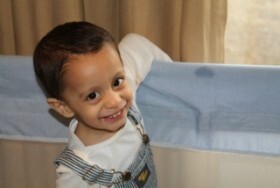 We got regular updates on his medical needs and developmental milestones. With his official referral paperwork, we received a 30 minute video of him. They showed us his daily activities and what life was like for him at the orphanage. Needless to say, this is one of our most prized possessions. We received notice on a Monday in early October that our son’s passport was ready and we could book our travel. India is known for their wonderful festival celebrations. One of the biggest festivals, Diwali, is in October. Once again, we had to make a quick decision, do we wait until after Diwali to travel or do we leave in 4 days and pick him up before the holiday. We quickly decided we wanted to leave as soon as possible. We booked our flights and hotels, made medical and embassy appointment, and packed in 3 days. By the Friday afternoon of that week, we were on a plane to India. Our time in India was wonderful! We were there a total of 12 days (average stay is 7-14 days) On the day we met our son, we were able to spend the whole day at the orphanage getting to know him, the nannies, and the other children. We learned his daily routine and were able to ask any questions we had. This also allowed our son to get to know us in his environment. They had a beautiful farewell blessing ceremony for our family when it was time to go. We spent a few days in Pune learning how we work as a family of four before we went on to New Delhi to finish the visa process. Our travel experience was great. The staff at both our hotels were very accommodating and helpful, they wanted to do anything to make our time there easier. They arranged drivers for us, who spoke English. We always felt safe and well cared for! The Indian people are some of the most gracious and giving people I have met. Our son has been a part of our family for almost a month now and his transition has gone well. He is slow to warm up to men, as all his caregivers were women. He has the brightest smile and a strong, but wonderful personality. He can do anything he sets his mind to. He runs after his big sister and always wants to know what she is doing. Ninety nine percent of the time, I don’t evern think about his “special need” We have not found a single thing that limits him. He has adapted and can do anything a typical 21 month old can do, and many things that are ahead of his developmental stage. Things will come up in the future and we will figure out together. For today, I am enjoying my beautiful, bright, spunky son and feeling so thankful that we get to be his parents.